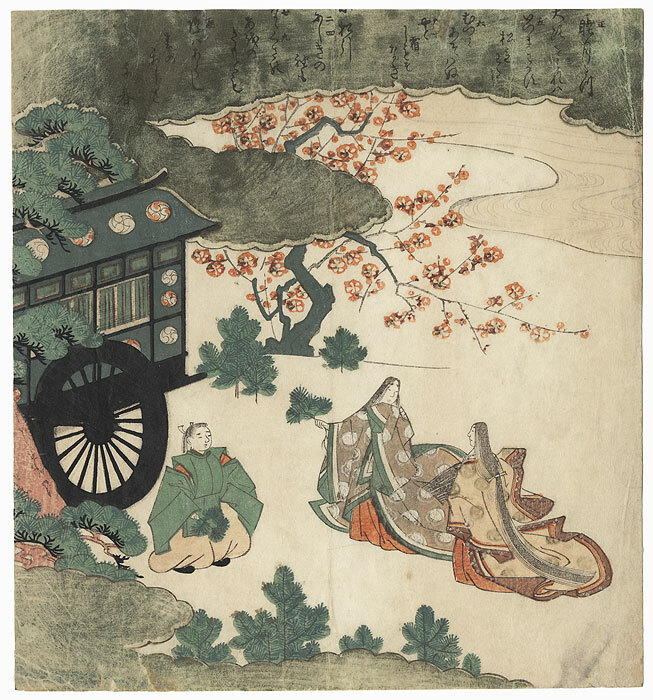 Japanese Woodblock Surimono - Surimono are an exclusive subcategory of Japanese woodblock prints. Poetry clubs commissioned these designs for distribution to a small audience of members, most often as New Year's greetings. These privately published images included a wonderful range of subjects and lavish printing techniques such as embossing, burnishing, and metallic pigments. 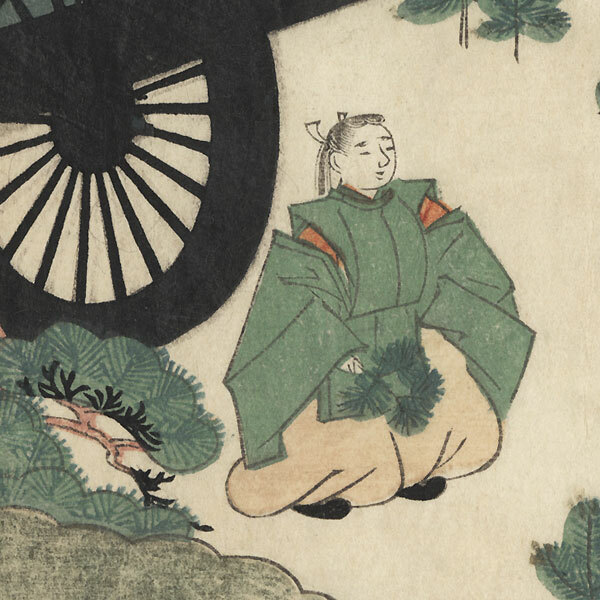 Since surimono were not sold commercially, the print runs were very small and original Edo era surimono are incredibly rare in the market today. Comments - Handsome Edo era surimono of a nobleman and two Heian era beauties on an outing to pull pine shoots, a traditional New Year's custom. The beauty in the center holds a pine sprig as she chats with her companions, their long robes trailing onto the ground around them. 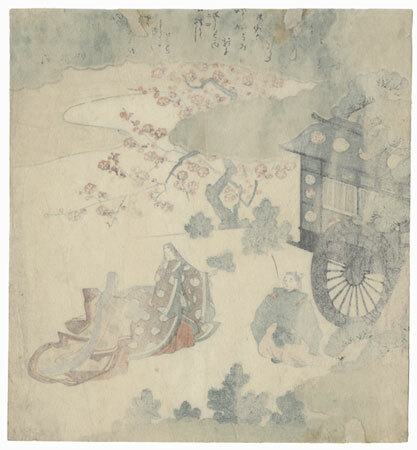 An elegant carriage waits at left, and a plum tree is covered with blossoms and buds. Clouds frame the scene, with a winding river at upper right. A lovely design, beautifully composed and detailed, with embossed white medallions on the beauty's robe, embossed flowing current lines on the water, and metallic pigment that has oxidized to a dark tone on the clouds. Image Size - 7 5/8" x 7"
Condition - This print with excellent detail as shown. A couple small losses at edge, repaired. Slight toning and soiling, a few creases and spots, slight rubbing at edges. Please see photos for details.